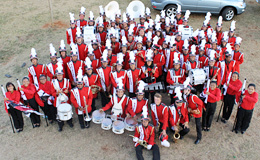 The Kauai High School Marching Band, directed by Darryl Miyasato will be joining the Honolulu Festival for their first time this year. The band is led by Drum Major, Trysten Caberto, who will also double on lead trumpet. They will be playing “Gonna Fly Now” and “Back to the Future” in the band festival and grand parade.